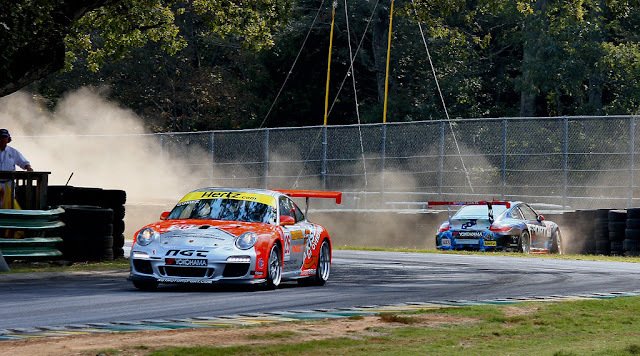 The IMSA GT3 Cup Challenge by Yokohama held its penultimate rounds at Virginia International Raceway on September 14-15. The race marked the return to action of Carlos Gomez in the Axis of Oversteer GT3, newly patched up after it was "viciously attacked by a wall" in Montreal this past June. Carlos had to come to terms with a track he had never driven on in a GT3. After, as he put it, "being humbled" by the track in the first practice sessions he found a massive 3 seconds a lap in qualifying with help from NGT's Ramez Wahab and his coach, Team Falken's Bryan Sellers. I'm sure he had a peek at James Clay's VIR track guide too. But I digress, here is his qualifying lap. 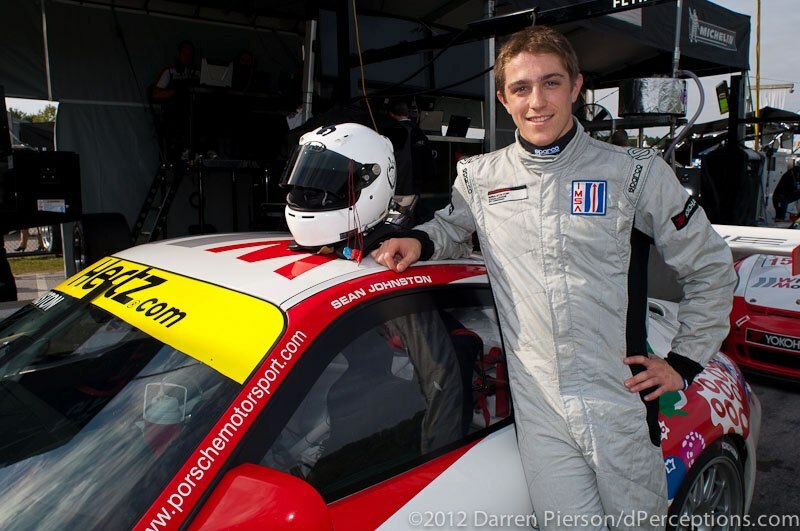 As a testament to how competitive the Porsche GT3 Challenge is, that time of 1:54.9 only put him in P10 for the start! The kids up front were just awesome with series champion Sean Johnston just putting the hammer down in Race 1 and literally pounding the field into submission with lap after lap in the 1:54 sec range. He won by almost 30 seconds, impressive. While the "kids" were running amuck up front, Carlos spent the race in a death match with NGT-Momo team Mate Eduardo Cisneros. 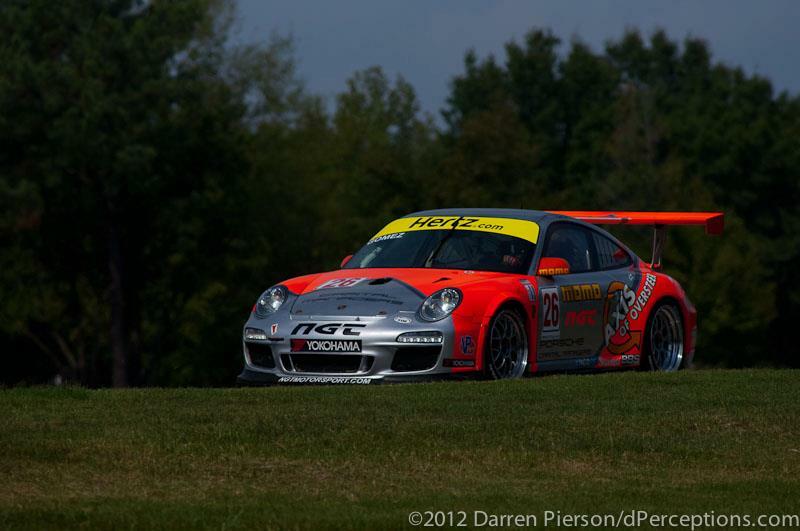 As you can see VIR is not a place where you can pass easily. The struggle continues for about 24 minutes until Cisneros, probably out of tire grip, falls off at the "NASCAR" corner. Carlos ended the race in P7. In Porsche GT3 Challenge, the starting grid for the second race is determined by the best lap time during race 1 so CG started in P9 with Eduardo Cisneros in P8. The two quickly pass Mike Mills in the Effort Racing/God.tv car at the start. Mills did not take that kindly and on lap two tries an unlikely, given his position, dive bomb into turn 1. Does not work and I suspect, it was red mist all over when he tried an even more unlikely dive, from miles back into the turn before "Oak Tree". Trying to go into a corner 30mph faster than anyone else takes a lot of faith but, as they say, physics gets you every time and Mills ends up into the tires. Gomez finishes the race in P5 from P9. The whole story of the race is told in the official Porsche Challenge video put together by Leo and JF from Drive. 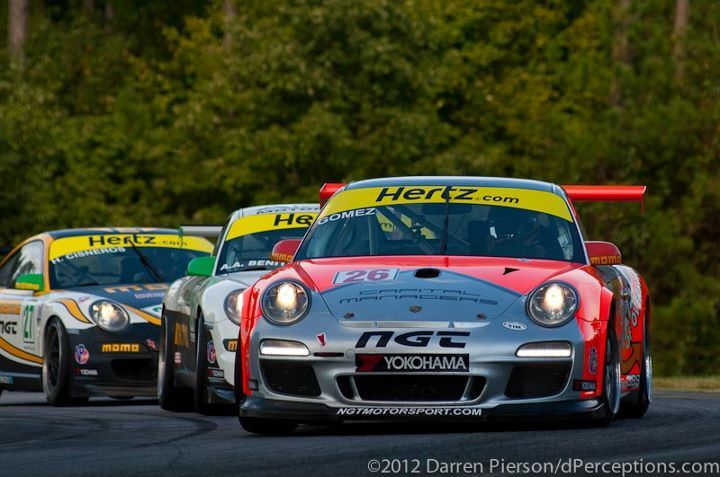 The final appointment of the season will be at Road Atlanta in support of the Petit le Mans on October 17-20. I see several IMSA challenge guys in 2nd gear in turn 1, and even turn 14. 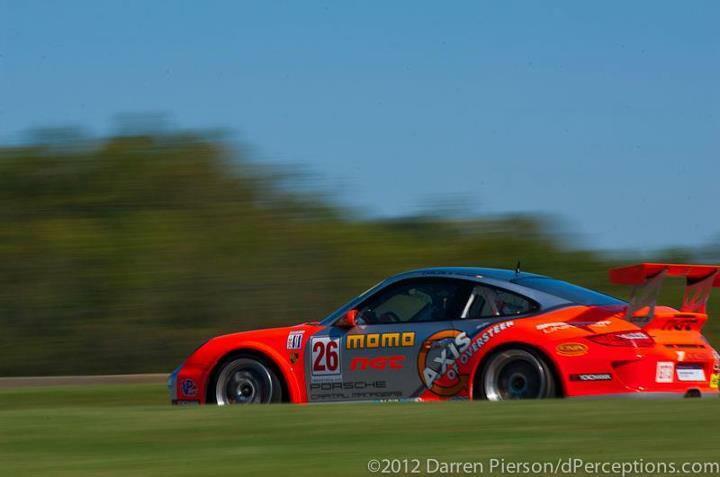 And Carlos Gomez is in 5th up the esses. Not the way I usually see people do it in a cup car, but maybe I learned something.